A 12-member delegation comprising Extra-Judicial Execution Victims Families Association, Manipur (EEVFAM), Human Rights Alert (HRA), JPE, Apunba Manipur Kanba Ima Lup (AMKIL), Tammee Chingmi, Nupi Samaj, UMO, Nongpok Leirgak Apunba Lup and Nanchup Imptal Arunba Mera Paibi Lup called on Manipur Governor, Najma Heptulla at Raj Bhavan in Imphal on Monday to voice their various grievances. 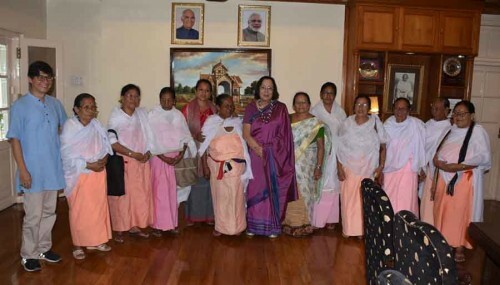 The delegation apprised the Governor of the unwarranted delay in the CBI’s further investigation concerning the July 23, 2009 fake encounter in particular and the other fake encounter cases of Manipur in general. Chungkham Taratombi, who was also part of the delegation, sought the intervention of the Governor in finding the truth behind the daylight murder of her son, Sanjit. The Governor assured the delegation of her unconditional solidarity in stopping such unjustifiable killings and to seek justice of the past killings. She also ensured that she would write to the government pertaining to the specific case. Notably, Sanjit’s mother filed an impleadment application in the High Court of Manipur asking the Court to allow her to be a respondent in the on-going case of Ak Jhalajit versus CBI.